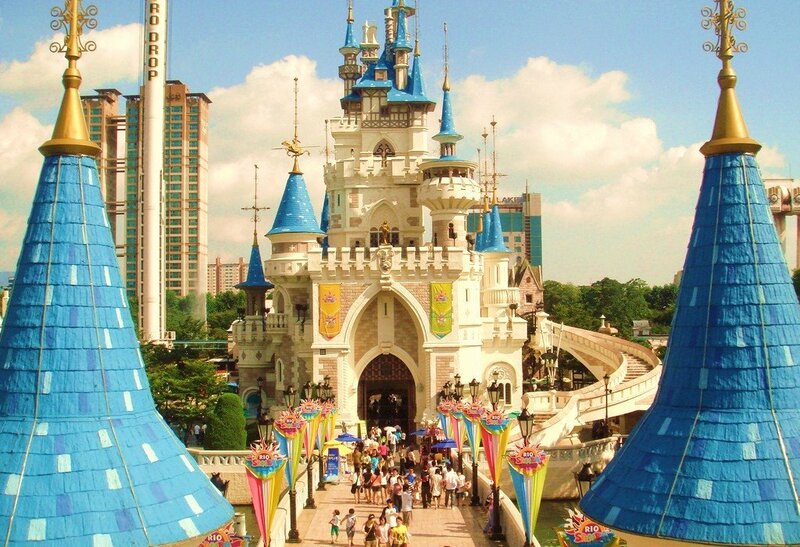 Lotte World, opened in 1989, is South Korea’s home grown answer to Disney Land and shares with it many of the same iconic themes to the degree that you have to wonder how they get away with it. It consists of a large indoor theme park, an outdoor amusement park, an island linked by monorail, shopping malls, a hotel, a Korean folk museum, sports facilities and movie theaters in one area. The Lotte World indoor theme park is one of the largest indoor amusement parks in the world, and ranked seventh worldwide in attendance according to the 2002 census. Opened on July 12, 1989, it receives about 8 million visitors each year. Lotte bills its World Adventure amusement park as the world’s largest indoor theme park. Opened in 1989, it was designed by some of the world’s most prestigious amusement park designers. The park has rides for everyone in the family, ranging from tranquil tram rides to exhilarating roller coasters. In addition to rides, the park has several shows each day and costumed characters that roam around. Operating hours: 9: 30 a.m. to 11:00 p.m.
Lotte World is also known for having the best IT systems of any theme park in Korea, initiating a broad range of computerized systems covering all aspects of its business. Lotte World makes for a fun, romantic date destination; a great place to take the kids; or an entertaining way to spend the day with some friends.